There was no A/C in the room. I asked about this BEFORE I checked into the hotel, and I was assured there was A/C in all the rooms. This is a lie...they have central heating........so if the room is to hit, you are out of luck. I was really upset. Over all the property is a good one, very neat and clean. Comfortable and spacious room. Nice upgrade, shame I wasn't there long enough to enjoy it! The environment and services especially from the receptionist, Celine and Daisy. The bed was very comfortable, the room clean and spacious, and the staff were extremely friendly, and everyone spoke English so communicating was easy. The staff were very friendly and helpful both at front desk as well as the concierge. The Duty Manager, Michael Zhang was extremely helpful with out check out. Thank you again! Most staff are very kind. They know what I need and give options even before I ask. Extremely efficient checkout helped by Emily. Will stay here soon again fore sure. Staff is nice and helpful. Small and quiet community nearby. Convenient store opposite to the road. Few minutes walk to Metro, 15mins ride to Airport/train station. Offering free Wi-Fi in all areas, Holiday Inn Shanghai Hongqiao provides a fitness center, spa treatments and an indoor pool. Qibao Ancient Town is a 3-minute drive away. 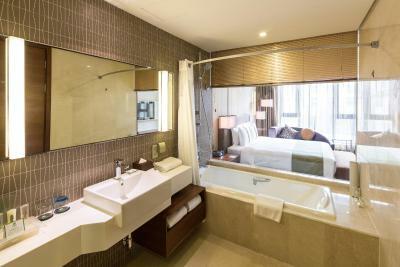 Holiday Inn Hongqiao is a 10-minute drive from Hongqiao Railway Station and Hongqiao Airport. Shanghai Zoo is a 15-minute drive away and People Square in the city center a 30-minute drive away. Hangzhou Road metro station (line 10) is an 8-minute drive away. Rooms here will provide you with a flat-screen TV, air conditioning and a mini-bar. There is also an electric kettle. Featuring showers, private bathrooms also come with a hairdryer and a bathrobe. Extras include a seating area. At Holiday Inn Shanghai Hongqiao you will find a business center. Other facilities offered include meeting facilities, ticketing service and a tour desk. Minhang is a great choice for travelers interested in riverside walks, tourist attractions and skyline views. When would you like to stay at Holiday Inn Shanghai Hongqiao? Located on more quiet floors, this 38 square-yard twin/double room features air conditioning, bathrobe and mini-bar. This twin/double room features a mini-bar, executive lounge access and sofa. Refresh in the large bathroom with rainforest shower and bathtub. This twin/double room has an electric kettle, bathrobe and mini-bar. It has a work desk , an ergonomic chair, an iPod docking and 32-inch LCD TV. This suite features a executive lounge access, electric kettle and mini-bar. This 50 square-yard suite has a separate sofa lounge, a walk in closet and two 37-inch LCD TV. Choose Holiday Inn Shanghai Hongqiao for a strategic location 5 minutes' drive from Shanghai Hongqiao International Airport and Hongqiao Railway Station, with good transport links to the rest of Shanghai. You'll receive a warm welcome in our stylish Lobby, which features bright artworks. All 361 of Holiday Inn Shanghai Hongqiao's spacious Guest rooms come with flat-screen TVs and wireless Internet. Host a conference in one of our 5 contemporary meeting rooms or choose our beautiful ballroom for your wedding reception for up to 600 people. All rooms come with extensive high-tech AV equipment and wireless Internet. Hop in a taxi to visit the Qibao Ancient Town with a history spanning over one thousand years. House Rules Holiday Inn Shanghai Hongqiao takes special requests – add in the next step! Holiday Inn Shanghai Hongqiao accepts these cards and reserves the right to temporarily hold an amount prior to arrival. Excessive deposit hold on visa account, should only be for the max room rate, and the payment should be taken from the hold. I didn’t anything where I would suggest an improvement. The staff is very friendly and welcoming. Too noisy and couldn't sleep well, because of the airport nearby. The decoration of the room is too sad and the room is too dark. It’s near the air port. Transportation is great. It would be perfect it the Chinese restaurant in the second floor offers cold beer. They had only warm beer!